I will first endeavor to explain what a “supra” is. This is not an easy task, however. Supra literally means table in English. It is a giant feast where Georgians toast anything and everything they can think of. At every toast an entire glass of wine is had. You start the feast with a table full of food. An American could relate it to the amount of food seen at a Thanksgiving meal. You take that amount and multiply it by six or seven. You pour wine (a cousin assured me that the alcohol content of this wine is more like beer, but I’m not so sure about that) into beer pitchers and sit a ton of people around the table. Then you make a toast every few minutes, eat some delicious food, bring out more food, make more toasts, sing some songs, make more toasts, bring more food, dance, more toasts, more food and it just continues like this for hours. It sounds a bit overwhelming, and, frankly, it was. Yet, there was more to this adventure than just the supra. It started Friday afternoon. Gocha and I got into his car and picked up one of his cousins who had a small boy with her of four or five. We picked up another cousin and headed off to Tbilisi. The car was an SUV. They are big vehicles but not really meant for five adults (Gocha’s car has a driver, Beso. I think it’s his Valet. Language barrier has made this difficult to understand) and a small child. Tbilisi is four-six hours away depending on whether you go 80km/hr or 160km/hr. We stopped at the same restaurant in the mountains for dinner. We had khatchapuri, of course, some grilled meat and pickled vegetables. We got to Tbilsi and sat out in a parking lot for 20 minutes before Nino and her youngest son came out. Her son told me in English that I would be spending the weekend with a family friend, Tamuna. Tamuna spent eight years in Russia with her family and spoke English pretty well. Her husband, George, did, too. They have two teenage sons that I met that night. They had super and then I went to bed. The next morning was a bit awkward. Waiting around for the family to wake up was odd. What are you supposed to do? Anyway, we went to Nino and Gocha’s apartment at 1PM. There I proceeded to wait some more. This waiting was mixed with short episodes of understanding the family was talking about me but not the details and having the cute cousins being herded towards me to entertain me since they spoke English. Finally, we went to the Church, the oldest church in Georgia. Beautiful doesn’t begin to cover the space. An Orthadox service was different but still held elements I could figure out despite it being in Georgian. I will admit that the crowning part was difficult not to laugh at. Both the groom and bride had to kiss each other’s crowns and then wear them for a bit. Next the best man and maid of honor took off the crowns to hold them above their heads. All four then proceeded to follow the priest in walking around an icon in the center of the church. I’m sure there is some great meaning in this symbol. But, it looked a trifle funny. Don’t worry, I didn’t actually laugh. I held on to some dignity and didn’t embarrass the whole family. 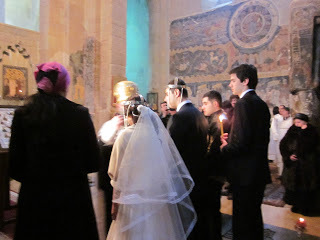 The wedding ceremony at the church. After the service, we went to the restaurant for the supra. There was some more awkward waiting and smiling at strangers staring at the foreigner, me, while Nino found a cousin to pawn me off on. I ended up at a table right by the wedding party’s table. This table was full of male cousins. Most of them spoke some English and were pretty darn attractive. The family has some impressive genetics, let me tell you. 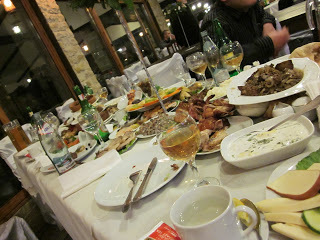 They helped to explain the toasts and encouraged me to try the endless platters of food that were brought out. I was next to the dance floor and got to dance with some fun people. One dance was even with a very drunk guy who kept trying to dip me. I refused with “ara” (no). He didn’t seem to understand why I wouldn’t trust him. I don’t know, a drunk guy who can barely stand up straight doesn’t sound like the best person to trust to hold your head a couple feet from the floor. It was a great party. 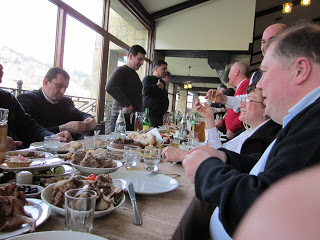 I just didn’t have the stamina of Georgians for the food and drink and dancing. It was exhausting. Georgians can party for hours. The young men love to show off how much alcohol they can consume. They are loud and cheer for the bride and groom. If you stand off to the side of the party you will see what must surely amount to chaos. The males wander from table to table drinking and chatting with everyone. It really reminded me of watching the celebrations of Packers’ fans after winning the superbowl. The hours of celebrations and the conversations for weeks later of the drunken escapades and game highlights were very similar to the longevity of the Georgian party. I will admit that Georgians have us Wisconsinites beat when it comes to alcohol tolerance. I have a new perspective on what it means to be drunk. There were no mean or weepy drunks to be seen. They were friendly and boisterous. It was an interesting evening. I spent the night with Tamuna again and met up with Nino and Gocha at the restaurant on Sunday. For four hours I engaged in another supra with the 30 closest family members. The Tamanda, the leader of the supra and toastmaster, was George. He and I had talked a lot during the weekend, and he seemed to adopt me as his own daughter. Therefore before I could leave after Gocha demanded that we be released to get back to Poti that day, he made a ten minute long toast about me and my teaching and my home state and how I was a part of the family now. (It’s not uncommon for toasts to take up a lot of time, this was just inconvenient) It was cute and quite the sendoff. The wedding supra was without a doubt the most adventurous activity I’ve done here in Georgia.